In this section of our cabinet fabrication measurements, I will explain the diagram showing how to figure the size of a drawer. Sizes will vary depending upon the style of slide that you may be using. 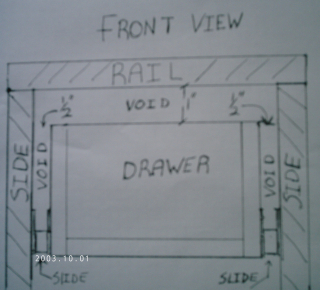 This tutorial shows the proper way to figure a drawer size for a side mount style of slide. These figures are universal for full extension and white epoxy coated European drawer slides. Our diagram is for the top drawer of a cabinet. Whether it be in a kitchen, desk area, vanity or laundry room, the application will be the same. When figuring drawer cut sizes for the fronts and backs, I usually just use a calculator. If my cabinet sides are 5/8 and my drawer sides are ½,” I would deduct 3 1/4” off of the over all cabinet size to get the cut size of the front and back of the drawer. When I am determining drawer cut sizes, I always deduct a little extra like 1/32” to 1/16” just to be safe. It is much easier to add a shim if a drawer is a little short rather than have to cut a drawer down because it is too big. If you want to build the European cabinet or face-frame style first and then work from the inside clear dimension of the box, this is the safest method to use. If this is the way to figure a drawer size that works best for you, then deduct one inch off of your measurement, if you are using 1/2” drawer side stock. Then cut your front and back just a little shy for safe measure. Notice that there is a one inch inside clear distance between the rail and the top of the drawer in the diagram for figuring drawer sizes. This allows room for the drawer to clear the rail when you are installing it with a white epoxy coated drawer slide that has the large wheels on its members. If you are using a straight ball bearing full extension drawer slide, such as the KV 8400 series, the 1” void can be much less. The standard cabinet sizes for clearance or the proper void between the inside of the cabinet side and the outside of the drawer is one half of an inch. As previously mentioned, take a little more off the drawer front and back sizes just to be safe. Sometimes the actual L-shape of an epoxy coated European cabinets drawer slide is not a true ninety degree angle. If you make your drawer box a little small, this will help if your slides are not a true ninety degree bend. That’s basically it for the process of figuring out a kitchen cabinet drawer size. The diagram only demonstrates how you should allow for void areas. Obviously, your drawer front and back sizes will be determined by the thickness of the materials you are using. I guess the main figure that never changes is the 1/2” constant for the actual drawer slide hardware.